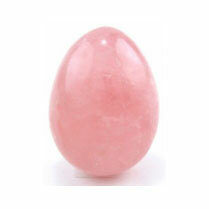 Yoni eggs are made from semi-precious stones/crystals. And they are beautiful. Now, I may be risking TMI, however I want you to know what happened to me. Initially, my bulbosponsiosus muscle was so contracted that it was painful to insert my large Yoni egg. Not any more. Today, I am stronger, more elastic and better lubricated thanks to my Yoni egg. If it can help me, odds are it can help you too. And yes, Yoni eggs are available in my office.